As we have read in previous posts, blogs and articles, our online presence not only already exists but is a helpful, necessary and sometimes dangerous part of today’s career reality. It is clear that whether or not we take the time to create a “Professional Portrait” online, one is being created for us. In the latter case our portrait may look more like a finger painting by a six-year-old than either a Picasso or a Da Vinci! So let’s accept what we have all come to realize: we must take ownership of the online portrait the world sees. Finger paintings are cute on the fridge but potentially career stopping online. The first step in creating our personal professional portrait is recognizing that it is a Da Vinci that we are trying to create. While a Picasso might be fun at a party it can leave potential employers wondering what they are looking at. The second step: Identifying what differentiates a Picasso from a Da Vinci. For example, a picture of me rocking out on my guitar might make for an interesting topic of discussion at a tailgate party but it could end the job conversation if I used it as my profile picture on LinkedIn, ResearchGate or other social media. Likewise, while I might have enjoyed a great time and a six pack at that tailgate party, sharing that experience is better kept to personal chats and far from my social media lest my Da Vinci get turned into a Picasso. The third step: Google it… or rather Google you. Type your name into the Google search bar and see what you get. Once you look through the hits switch to the “images” results. What did you see, a Da Vinci or a Picasso? Did you even come up in the search results or did your name bring up a worm farmer in Nebraska or a mortician in NY? Either way, do you think the person with an inbox full of applications is going to search any harder or just move on in their search for a Da Vinci? The fourth step: Decontaminate! You have done your Google search, you have read all your online profiles, you have reviewed your online photos. Now set a clean canvas. Wipe out your Picasso and get ready to paint your Da Vinci. The fifth step: Creating the Da Vinci! Choose a professional photo to represent your online ID and use it consistently. Choose a photo that represents the way you would present yourself if you get that interview. Fill your profiles and online conversations with information that best represents your knowledge and interest in the professional world you have chosen. Be a selective joiner. Increase the exposure and visibility of your “portrait” by getting involved in peer communities, but be sure they support rather than compromise the image you are working to create. The last step: Stay involved. Keeping your digital information current is essential to maintaining the “portrait” you have created. ReputationManagement.com says: “Though it’s true there are specific times when your online reputation really matters, maintaining a positive online reputation should be a constant effort. A need for a good reputation could pop up at any time.” Be active, post, Tweet, start and participate in discussions on LinkedIn and wherever your online presence exists. Last, always remember all it takes to turn a Da Vinci into a Picasso is a few careless or misplaced brush strokes. In other words, always be intentional with what you put online and never act on a whim, you may regret it. One last note: Also be aware of what you allow others to “tag” with your name. The only thing worse than painting a bad “portrait” is having someone else splash paint on yours! 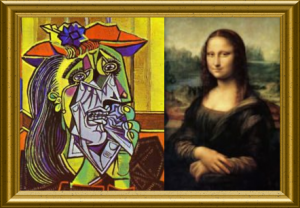 If you browse the links below as well as the “Career” topic on our whiteboard you will find lots of tips on how to be sure your portrait is a Da Vinci and not a Picasso. Not having a photograph on LinkedIn. “A LinkedIn profile is eleven times more prone to be seen if there is a photo” says Kelly Keating, co-proprietor of Red Letter Resumes. Post an expert headshot with your face unmistakably obvious for best results.